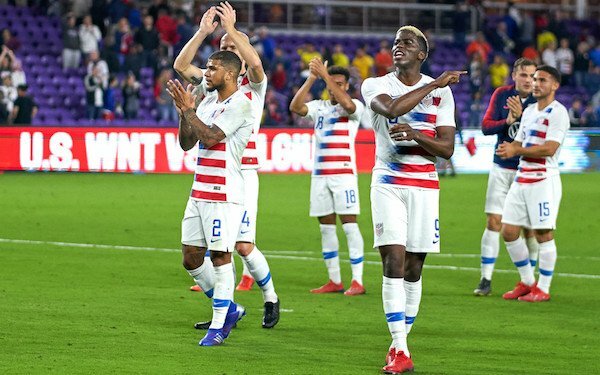 The USA didn't blow anyone's socks off in its formal coming out party under new coach Gregg Berhalter, but the 1-0 win over Ecuador Thursday night in Orlando is a start. And given what the national team program has been through the last four years under three different coaches and with the embarrassment of failing to qualify for the 2018 World Cup, it will take small victories like Thursday's win that came thanks to a fluke goal by Gyasi Zardes. Berhalter's young team, which included 20-year-olds Christian Pulisic, Weston McKennie and Tyler Adams starting together for the first time, was rewarded for at least trying to play, something it has rarely done in the last year and a half. Berhalter lined up five attacking players, encouraged Adams to move into midfield at every possible opportunity for another attacking threat and used his holding midfielder, Will Trapp, as the playmaker. The USA put on its best performance since the 4-0 win over Panama -- also in Orlando -- in October 2017, four days before its world came crashing down when it lost to Trinidad & Tobago, 2-1, and was eliminated from the World Cup. The coach on the opposing side then and now in Orlando was Colombian Hernan Dario Gomez, which might explain why Ecuador showed no interest in coming out and playing on Thursday. Panama tried to play and got blown out, losing by four goals on an evening when even Gomez said it could have been 10. Ecuador was a far tougher opponent than the weakened teams Panama and Costa Rica brought this winter for the USA's first tests with MLS players under Berhalter, but it sat back and defended in a low block. In many ways, La Tricolor, which had lost just once in six games under Gomez, was a perfect test for the new-look USA, showing how well Berhalter's possession-based game could operate and what were the limitations. The USA completed 602 passes -- more than it completed in its two previous games against South American opponents combined -- 297 against Peru and 243 against Colombia in October 2018. But its efforts translated into a paltry five shots and two shots on target. Part of that was Ecuador. It's hard to "disorganize" your opponent -- a favorite Berhalter expression -- when it has eight or nine players bunkered in the final third of the play. Berhalter's young players showed patience and confidence to stick with what he wanted them to do, but most of them are still too direct in their approach to rattle an athletic team like Ecuador. Berhalter was encouraged by what he saw, though. "On the day, if we’re a little bit sharper on some plays, a little bit more precise, then we end up breaking them down." he said. "What I really liked from the guys is the effort to continue trying to break them down in the way that we’re giving them." Berhalter admitted he tried to introduce a lot of new ideas to his players, some who didn't arrive in camp until the middle of Monday. “Overall, when you look at the amount of information we’ve given the guys in the last two days," he said. "we’re pleased with the performance. I think it’s a good starting point for this group." Almost to a man, Berhalter's players echoed what he said. 5 comments about "USA-Ecuador: At least it's a start, a good start". Bob Ashpole, March 22, 2019 at 10:50 a.m. I agree that the match was something to build on. I liked the way the team played in the first half, especially. It appeared the coach wants to use positional play, which I wanted to see, but it will be a long difficult journey down that road to reach success. If the US wants to raise its game to the next level, it is a change that will eventually need to be made for both the men and women. Wooden Ships replied, March 22, 2019 at 2:54 p.m. I agree Bob. Whether we call it positional play or moving off the ball smartly, we did seem more cognizant of where to be. However, even with positional awareness, the selected players (attacking) were short, nearly void, of required dribbling and close proximity combination abilities, that we weren’t very threatening. Also, I continue to believe having CP central is a mistake. He won’t hold up physically and will provide more scoring chances for himself and team being outside. It is early, but the front three from last night aren’t even close to what is needed to make the next jump. IMO, there is not enough time to be clever in leaving our more effective players spending time chasing Olympic glory. Looking forward to the Chile match. Bob Ashpole replied, March 26, 2019 at 3:04 a.m. It took me a while to figure out what the Dutch and others mean by "positional play". It is more than just good individual movement. It is also about the team being in a good position to control the match. I think of it as "smart soccer", but that is so subjective no one would know what I had in mind. What I liked about the team's play was that I think that the coach was trying to follow Dutch Style principles of play. They aren't there yet of course and maybe I am engaged in wishful thinking, but I am watching the team's positioning while attacking, especially the width of the lines and the distance from front to back lines. I am also looking for diagonal balls and combination play to break lines and pull the defense apart east-west. The attempt to play this way highlights the individual technical deficiencies, bad decisions and slow play. In terms of the team, those problems can be fixed over time. Frank is looking at a lot of the same things and seeing a lot of problems of course. I just have a lot lower expectations than Frank. Like you I am concerned about using players out of position. When you have an excellent winger--someone that will pull CBs out wide, why play him inside? We don't have many players trading for big bucks. There is a reason that players like Messi and C Ronaldo play wing and not CF. Alan Goldstein, March 22, 2019 at 11:12 a.m.
beautiful game, March 23, 2019 at 9:58 a.m. Anyone half-satisfied with this performance remains comatose in fantasyland. Our NT squad underperformed against a mediocre Ecuador and never attempted to dictate the game. As long as Zardes and Bradley et al are kept on the roster, they will take up space for the young and as yet unproven talent. I was totally disappointed with coach B's tactical aprroach in this contest. Playing not to lose is playing not to win.